I came across the above article in the New Zealand Herald of Monday May 2. I am interested in this subject, especially the Sea Level Rise aspect. This is because my Local Government is currently is starting to put pressure on 18,000 private properties which are believed (by the Local Government) to be “in danger of inundation in 100 years time” . This action is based upon a report commissioned by my City Council which assures us that there will probably/most likely be a 1000mm sea level rise within that 100 years. I have studied this report as well as a few others produced by the same agency. In all there are three or more reports upon which the Christchurch (NZ) City Council is using to justify their actions. In New Zealand, each property title has a document called a “Land Information Memorandum” attached to it. This gives details of any possible hazards and town planning obligations etc. that apply to this particular title. This is essential and generally helpful reading for anyone wishing to purchase that particular property. Initially the council wants to put an entry in the memorandums of the above mentioned 18,000 properties siting that inundation, (depending on the zone of the particular property) will happen within 50 years or 100 years. More ominously the Council also aims to designate “Inundation Zones” on the district plan, the intention being to allow them to control development within these areas. Most importantly, before any significant improvements to any property in this inundation zone are allowed, they will demand – what is known as a “Resource Consent”. I should know, I spent $200,000 and a lot of my time to try to get approval for a perfectly reasonable and GREEN project and after a number of hearings and court appearances, I failed. Most citizens of my city now easily recognize that this will not only restrict the living of the affected property owners but is the first step to start “legally” clearing residents out of these areas. There is no doubt that, should the council have its way, there will be at least, a profound drop in property values in these areas, which in itself will cause people with large mortgages hardship and for obvious reasons probably force their exit and break them financially. It is also thought that insurance may be impossible to attain. Although because of a backlash and protests by the residents of the area involved, the Council has withdrawn the process for the time being. However some groups are now organizing to try and fight this heavy handedness.May these groups keep the pressure up because it is apparent that the Council is not giving up on this action but more biding its time for the best opportunity. My research showed that key documents that the Council is relying on here can only be described as extremely shoddy and alarmist in their compilation. First of all the current sea level rise, according to well researched academic studies, shows that currently THE SEA RISES 1.7mm per year, which it has been since records began and NO ACCELERATION HAS YET BEEN DETECTED! Although some of the above mentioned reports which the Council is using as “Authority”, ( which I found generally poorly referenced as to where their information came from), actually reference these same academic studies above, they have not seem fit to mention the important little fact, that there is no empirical evidence showing acceleration of sea level rise, is stated in their text. Hence I wrote three times to the paper requesting the source of their article and especially this “New Report” mentioned in the first sentence, of which one can read in the next paragraph, was published by the Royal Society of New Zealand. First of all, a paragraph of the newspaper Article. With a historic global climate agreement about to be signed in New York, a new report has laid bare how New Zealand will be affected by climate change. The report, published by the Royal Society of New Zealand, has found that climate change, already underway, will almost certainly accelerate this century unless drastic action is taken to reduce global emissions of greenhouse gases. Changes expected to impact New Zealand include at least 30cm and possibly more than one metre of sea-level rise this century. The report finds it likely that the sea level rise around New Zealand will exceed the global average, which will cause coastal erosion and flooding, especially when combined with storm surges. “Many New Zealanders live on the coast and two-thirds of us live in flood-prone areas so we are vulnerable to these projected changes,” said Professor James Renwick, chair of the expert panel who wrote the report. Even small changes in average conditions can be associated with large changes in the frequency of extreme events, he said. The report highlights six major effects we can expect to see. • It is very likely that the rate of sea level rise around New Zealand will exceed the historical rate and exceed the global average – at least another 30cm is virtually guaranteed this century but the rise could exceed 1m. • With a 30cm rise in sea level, the current one-in-100 year extreme sea level event would be expected to occur once every year or so in many coastal regions. *Rising sea levels mean rising coastal water tables, leading to semi-permanent or permanent inundation of low-lying areas, and the potential for salt water to get into freshwater systems. • The implications for coastal populations will vary widely, depending on the shape of the coast, the distribution of buildings and structures at risk and their vulnerability, and the differentiated make-up of communities themselves. *However, the recent report of the Parliamentary Commissioner for the Environment indicates that thousands of households in many towns and cities will be affected. • These communities will need to plan for and adapt to change and some will need to decide whether to “hold the line” or relocate in response to known risks or actual climate change impacts. “Six reasons you should worry about climate change”. For instance you mention “A new report” then later we find it is “ published by the Royal Society of New Zealand”. “This new analysis supports at least two other conclusions. According to all the sources I can find, there is no acceleration of sea level rise yet detected in NZ waters – and unless an acceleration, which obviously is a necessary condition in order to attain 300mm of sea level rise during the next century, is empirically detected, any prediction of sea level rising is simply pure speculation. I would also venture suggest that if you are basing your article on a similar report to RSNZ 2010 the quality of your reporting is not in the least enhancing the reputation of your organization. According to these sources, the sea level change in New Zealand shores is recorded as being a constant 1.7mm per annum since recording began. In order to cause 300mm per century it needs to double and to attain 1000mm per century it needs to multiply by more than a factor of five! The catch is that this acceleration has not yet started. However, I am very interested in this “New Report” and I trust that you can direct me to this publication so I can assess it for myself. I have not mentioned any of the later statements in your article which are presumably also based on this report, but it is difficult to give then credence unless there is some empirical break through which can suddenly validate these claims. Therefore I am very keen to study these. Another example is http://climateaudit.org/2005/11/18/archaeological-finds-in-retreating-swiss-glacier/ which discusses early artifacts left during medieval, roman and stone ages that are being discovered emerging from the ice and snow. It appears that this area has been used a short cut between North Italy and the Bernese upper country for a number of periods in early history. I sent the above email three times and only got an automated reply each time, saying that I would be contacted within three working days. Of course I have not been contacted. Well with no help from the newspaper, I did eventually find what must be the report in question. My apologies to the readers who tried the above link and ended up facing a log in screen. It appears that the Royal Society didnt really want too many people to read their paper. It is a rehash of the report I mention above (RSNZ, 2010) and uses some of the same wording. is absent:- No claim that acceleration has been detected, no mention of the current data at all. Even worse, I cannot find any scientific references refering to sea level rise in this article, (except Bell and Hannah part of which was quoted above), (via (RSNZ, 2010), but omitting the last key phrase. This “report” is therefore demonstrably not an authorative report, it is not a scientific report – it appears to be a summary of scare mongering rumour and should be treated as much. Even if we can believe such speculative predictions which the NZ Herald is thrusting on the public, sea level rise will never be a tsunami, and there will be plenty of time to enact suitable measures if and when an actual acceleration in sea level rise is detected. We the people of Christchurch and especially the 18,000 property holders being bullied by the local government deserve better than this! These look horrifyingly green to me, but they only border on communism. Of course in this short post I have only dealt briefly with education. PS. 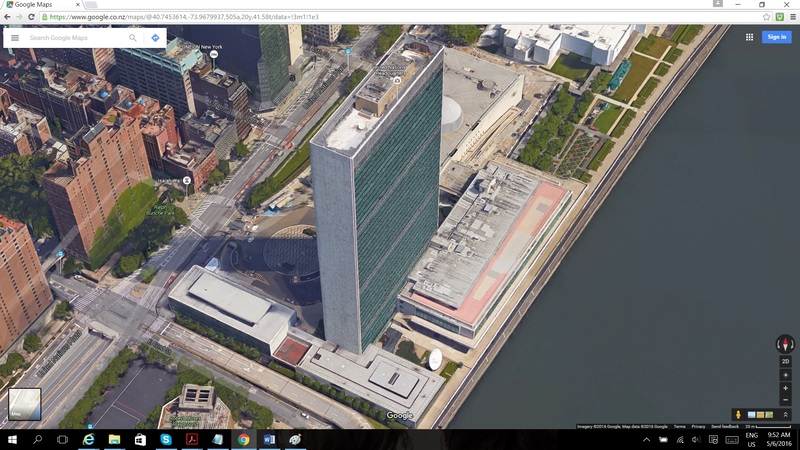 Found this blog which illustrates how the UN is moving into mathematics. I have read a few papers on this subject but never seen examples like this before. Just check the arithmetic homework that your kids bring home. If you are suspicious about anything that your children are being taught, put it in front of the Principal or head teacher for an explanation. Remember that this is happening wherever the UN can get a foot hold. We are not immune in New Zealand. This is a reply to a comment left for me on http://wattsupwiththat.com/2016/03/17/europe-struggling-to-decide-whether-climate-is-still-a-priority/. I think it is a very relevant reply to anyone who thinks that the UN is a benign organization that aims to bring peace and tranquility to the world. A better description after doing some deep reading would be “The UN is a non benign organization whose aim is to bring order throughout the world by means of a despotic program of imposing extreme socialism, on normal people through the imposition of a collective society”. Secure property rights are FUNDAMENTAL to personal freedom and democracy. I believe I have found the reason why such incredible powers have been used in the so called “rebuild” of Christchurch. My reasoning is based on what is found on the Christchurch City Council’s website and the associated documents which are used or referred to by the council. Please follow the links I provide, which will, step by step, reveal what the people we elected are up to. There is no doubt the explanation for the actions of our government is outrageous, but the things you will read are more than mere coincidence. Lets review some of the more obvious things that have happened. If you are a citizen of Christchurch, you will know all these things anyway. Red zoning in the suburbs. We have seen whole suburbs “red Zoned” which means that these will be compulsorily taken over by the government (with negotiation with insurance companies) and at 2008 valuations. Stop Press. This is an update about events that are happening as I write. 1. Their property though uninsured, is either undamaged or quite repairable. 3. Their property is not damaged or only slightly, so why should they have to move out at all? 1. The government acted outside its powers in creating and enforcing the red zone. 2. The property owners be properly compensated using legal means. 3. Made a declaration that the decision to create the red zone announced on 23 June 2011 did not lawfully affect the property rights of the property owner applicants in the proceeding CIV-2013-409-000843 (the ‘Outcasts’). Of course the government has appealed and this appeal is happening about now. 21/04/15 The appeal was largely upheld but the Government took it to the High Court where the case was upheld on a split decision. Not much relief for the complainants though because the Court has declined to suggest compensation – (instead simply instructing the government to reconsider this point) – but what is upheld is that the government did not act within it’s powers! Can it be that the Government is so set on pleasing the United Nations that it will break it’s own laws to that end? Because the Christchurch City Council and the central government, has raised the standard of building required, (ranging from a minimum seismic proof foundation, double glazing and even the distance from the oven to the opposite bench etc), it is therefore impossible to actually replace your house with the insurance and purchase payouts anyway (if one’s payout ever comes). It seems from some reports that an average retired couple with no hope of raising a further mortgage, may be several hundred thousand dollars short of replacing their previous lifestyle. But regardless of whether the house is still liveable, the occupants must move out. Some “Red Zones” include entirely undamaged houses where the red zoning is justified by there being a “Rock Fall hazard”, in spite of the fact that in many cases no actual rocks have fallen on or nearby during any of the earthquakes. The citizens therefore appear to be being locked out of their houses for no discernable reason. In other red zone suburbs, the reason is given is that the council will be unable to provide services to that area. However the citizens still must leave, and the opportunity of any attempt for these citizens to organise their own utilities has never been on the agenda. The same excuse has been used in limiting new housing developments where some developers feel that installing blue water waste systems for new houses is a perfectly acceptable and “environmentally friendly” solution. This would remove the burden on the council which admittedly is stretched in supplying reticulation to western suburbs and would hasten the supply of much needed buildable land. Unfortunately this is not acceptable by the bureaucracy. Please note that these red zones generally follow the river boundaries and although the damage in many areas is devastating, they most certainly include a significant number of undamaged and/or repairable properties. Not moving is not an option – if you elect to stay in a red zoned property utilities will be cut off and your property will be effectively confiscated anyway. Well the above link has been changed, although if you are interested it does serve to enable one to look around the correct government web area. Fortunately I copied the information so I can give you a link from my own library. This booklet can still be found at the above site but you will need to search for it. Demolition of buildings behind a cordon with little or no consultation with the building owners and their tenants with no chance to recover business and personal property (Although some cases were documented where the demolition people stripped the building and on sold everything of value). “Red stickering” of buildings meaning no one– including the owner could enter with no provision for the owners to recover property. Only after contracted protest after weeks and months later were essential business files and plant able to be recovered. The building owners and tenants were therefore prohibited from guarding their property. Therefore apart from the inevitable theft, there was consequential and preventable damage from weather, flooding and after shocks. The creation of an impenetrateable bureaucracy where for instance, a demolition plan was demanded from the building owner within a short period of time, but even if that plan was presented, the bureaucracy carried out the demolition anyway, not only trying to contract the liability of any accidental damages to life and other property to the buildings owner, but also charging a “management fee”. The bureaucracy acted so slowly in any case that most small business owners went out of business, not only because they could not even recover the cash from their till (which was typically consequently rifled by persons unknown) but their customers were locked outside the zone as well. The time between the earthquake and the recovery of essential business property bankrupted these businesses and as tenancies therefore lapsed, after more than two years, the building owners are facing financial ruin as well. Especially as enough time has now passed for typical business interruption insurances to have run their course. Yet even accepting that all the streets were too dangerous for the public (which they weren’t), it would have been simple for the bureaucracy, once all life and limb was accounted for, to actively assist these businesses instead of locking them out AND thereby helping restore the associated employment and jobs these businesses bring to the city. Another branch of the bureaucracy has been given the responsibility to “manage” the Christchurch “rebuild” but through the conferred monopoly (all repair work must go through this agent), has leveraged the price of builders labour to such a low level that many builders simply cannot find work. And the “agent” takes a commission on all repair/building activities. The central and local government does not pressure insurance companies to make timely payouts. As a consequence, few private rebuilds are occurring. Many payouts are estimated as being years away. Government intends to resell property back to the private sector after plan is implemented. In any other context this would be construed as speculation by the government using private property and tax payers money! Why completely demolish our old city including perfectly good and functional privately owned properties in order to build a different new city? This is the sort of thing we criticize third world countries about. It doesn’t happen in good old “democratic and free” New Zealand does it? Finally we have imposed on us a “Plan” for the new Christchurch CBD which bears no resemblance to the Christchurch we all know and love. Not only that but there are a good number of ultra expensive items whose cost will need to be met by the rate payers of Christchurch, the tax payers of New Zealand and our children and grand children. “The Canterbury earthquakes have provided an unprecedented opportunity to rethink, revitalise and renew central Christchurch” Christchurch Central Recovery Plan. P 3. – created at our expense. Make no mistake! We and future generations are being mortgaged to pay for all this. Are the CCC and the government crazy or have they at least lost the plot? There is no doubt that this authoritarian approach has slowed the recovery from the earth quakes. Government energy directed to making sure insurance companies are meeting their obligations in a full and timely manner would definitely be better than the bureaucracy we have now! there is another agenda which is at work here. Take a read of this link from the Christchurch City Council website! Sustainability is a word that is used often, yet means different things to different people. This Sustainability Policy seeks to clarify what the City Council means by the term sustainability. This will enable Council policies and strategies to adopt a consistent point of reference for the term and for the related concepts and principles to be incorporated with more consistency into Council activities and decision making. The Sustainability Policy is one of the high-level Policy Frameworks that have been designed to help guideCouncil activity. There it is in black and white. The Christchurch City Council is committed to making Christchurch a “Carbon Neutral” city! This is the “unprecedented opportunity” given to the Christchurch City Council and the Global Warming proponents in government by our disasterous earthquakes! Not only are they persuing an unadvertised/hidden agenda but they are also taking advantage of cantabrians many of whom are facing their darkest days and years. Well that gives them a fairly blank card to do what they like dosn’t it? Except for the mention of carbon, this policy is actually a summary of Agenda 21, a product of the UN Conference on Environment and Development (UNCED) held in Rio de Janeiro, Brazil, in 1992. Global Warming caused by Carbon Dioxide emissions (thats the meaning of “emissions” in the councils policy) was not invented in 1992. In this policy, the Christchurch City Council does not mean financially sustainable, they mean that they are going to make sure that Christchurch is going to be in the forefront to do its part in saving the planet from “carbon dioxide poisoning” or “Anthropogenic Global Warming”. Some may think the council’s efforts to “save” the planet is a good thing, some may be ignorant on the subject, others see carbon dioxide induced global warming as the biggest crock in history. But no matter what you believe, and regardless whether Anthropogenic Global Warming is real or not, the theory through Council and Government policies I have shown is affecting us right now. Christchurch is our city and it is being changed into another city. Their agenda is not to restore Christchurch into the vibrant city it once was that we all knew and loved but to create this futile Carbon dioxide neutral city ! I say futile because even if the theory of carbon dioxide heating the earth was fact, New Zealand produces only 0.11% of the world industrial carbon dioxide. Therefore if New Zealand was removed from the earth, global warming would not be significantly affected in any way. The Christchurch City Council aided and abetted by our government sees the Christchurch earthquakes as an “unprecedented opportunity” to make Christchurch into the worlds first absolutely Agenda21 complying Carbon Neutral Eco City. However this link gives us similar information. Like all UN documents, at first read it looks reasonable, however on closer examination one begins to realise all the doors it opens. There are also a host of ancillary papers etc. published by the UN and its subsidiaries which detail particular objectives in more detail. Agenda 21 of which NZ is a signatory, states among other things that governments should “Transfer land” and make laws to protect river margins, make cities sustainable and pollution free and move populations into these cities so cars are unnecessary and suburbs can be returned to their natural state. Populations should be crammed into small eco compartments in the cities and even population control is mentioned. Did you know that Christchurch City is a member of Local Governments For Sustainability? which is the way Agenda21 is implemented through the back door by advising and funding local “initiatives”. It is not a coincidence that the Christchurch Recovery Plan ticks all the boxes for a Agenda 21 complying city. The United Nations Agenda 21 and other agreements have already entered our legislation! Check out this page from the NZ Ministry of Environment website! Here is a typical link which describes the effect of Agenda 21 and ICLIE on their city. Watch the videos and search for other opinions. United Nation documents are designed to look reasonable. It is only after careful interpretation and examples of implementation that one gains an idea of the insidiousness of the organisation. No wonder the CBD of Christchurch is being compulsorily “purchased”. Were you consulted when by the Christchurch City Council or government about any of these things? Definitely not, but we and our children are the ones who are and will be paying for it. Worst of all, our democracy and freedom is in more danger than we realise. The UNITED NATIONS is not the government of New Zealand! Lets be careful who we elect into Government and Local office. At election time grill each candidate about Agenda 21 and ICLEI. What ever your political leaning, lets keep New Zealand sovereign and democratic. This blog is intended to promote discussion on the future of Christchurch. If you have a fact or something that should be included here, please comment and I will most likely include it. If you think some of the things in here are not fact, I would like to hear from you too. If you think Bob Parker’s “Eco City” is a good idea and you are ready to help pay for it – please comment and tell us all why. If you have a relevant article send me the link and I will include it here. Our only way out of all this is to make sure we are all informed about the issues of today, We as a nation need to not blindly vote at elections but need to understand these issues and vote according to the policies. Be very dubious about election bribes, because a policy that offers to create or support something can only be done using your tax money. Make sure that policy spends your/our money wisely. I will be updating this blog regularly, we have barely scraped the subject here. A government which robs Peter (Those working and paying taxes) in order to pay Paul( those for one reason or other do not work) can always depend on the support of Paul. and check page 41: or click on the book mark “Ideas to reality” and read the following. Over the long term, greater Christchurch has a unique opportunity to redevelop the city so that it is resilient to environmental, social and economic changes that may affect future generations. Greater Christchurch can expect more droughts and floods and a rising sea level due to the changing climate. Energy costs will increase the demand for efficient energy and transport systems. New technologies and competition for global resources and talent will reshape the way business is done. You might ask a councellor where the measures are to guard against “floods and a rising sea level due to the changing climate.” seeing as how Christchurch especially the CBD is barely above the high tide mark. Would also be educational to ask a councellor approximately how much are sea levels expected to rise should the ARCTIC ice melt completely. If you know the answer to that, please comment. I know the answer down to the last millimetre so I can correct you if you get it wrong. Congrats to the Greens, your policies are now enshrined in our legislation and we have a government who is prepared to trample over our property rights to carry them out. Shame on you Greens for pretending to protest about this in Christchurch on Dec 10 2011. You must have been chuckling up your sleeves all the way to Cramner Square. No wonder you tried to shout down the Act Party representative! Check out this article in the Christchurch Press. Consistent with Agenda 21, our government is getting ready to concentrate citizens within the Christchurch CBD. Did I mention that above on 29/11/12? Yup just a few paragraphs read above and there you will see it. No I am not a soothsayer, the progression is quite clear when you study Agenda 21 a little. Next we wait for population control and restrictions on farming. Goodby democratic NZ!